Requirements: Compatible with iPhone 3GS, iPhone 4, iPhone 4S, iPhone 5, iPad2, iPad3, iPad Mini and iPod Touch. Requires iPhone iOS 4.3 or later. 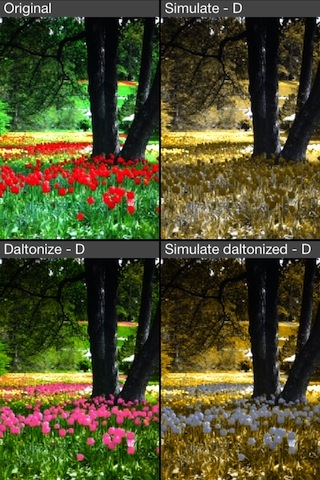 iDaltonizer is an app for iPhone, iPad and iPod that helps colorblind people to see the world in a new way! Discover it! Colorblindness ranges from being a minor irritant to a threat to life. But as long as you have an iPhone with iDaltonizer, you need never be colorblind again! Our multi-purpose app's most crucial use is to enable colorblind persons enjoy good vision, at last the world is not a grey mass. Now you can distinguish between those troublesome reds and greens. 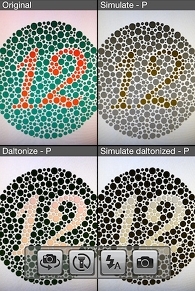 iDaltonizer is customizable, not only to a particular type of colorblindness, but, to each person's unique vision needs! Type, anomaly, and correction are adjustable. Thus, our app can be fine-tuned with precision. For all these reasons iDaltonizer also makes an excellent gift, one that is both useful and informative. 'Daltonize' your eye by buying eye-Daltonizer today! Colorblindness type, simulation level and correction level fully customizable. Different views to enjoy a new vision of colors. Zoom/magnifier, photos with and without flash, front and rear camera supported. It helps me every day!!! 4/5 stars! Not that easy to use, but results count. I was able to easily pass a color blindness test for the first time ever. I doubt I see same thing as others, but at least it's something! Color missing areas became lighter. First of all, read carefully the following answers, please. Here we answer to the most common questions of our users. If you don't find the solution to your doubts, please send an email message to support@idaltonizer.com in English. We will answer to you soon. Do I get a normal vision with your app? Unfortunately nobody can cure colorblindness problem, but you can see the difference between colors in a way you have never tried before. Is this app compatible with iPad 2? Yes, this app is compatible with iPad 2 perfectly well! I don't know which is my colorblind type! The most common colorblind type is Deuteranopia. Try to set D in the main panel of your app, as showed below. If this modality is not suitable for you, please contact your optician for more details on your vision. Can I take pictures with your app? Yes, of course! You can take pictures in a variety of different modalities (simulation only, daltonized images, compared normal images with simulated, etc). You can enable or disable flash too and the torch, to take pictures in the dark. One seldom finds a portable 'app' to ease a particular medical condition such that it delivers solutions superior to those provided by condition-specific medical instruments that cost far, far more. 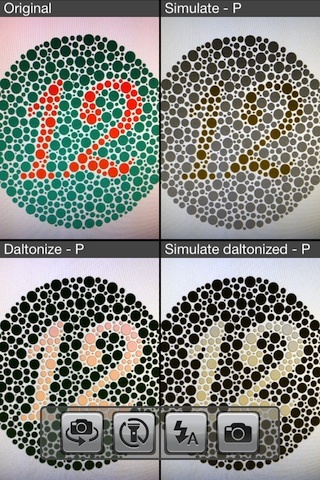 Yet, thanks to the iPhone's OpenGL system and the creativity and dedication of two software engineers, iDaltonizer is quite probably the richest and most feature-complete solution for colorblind persons as well as for those interested in colorblindness (HealthApplication). Yet this all-round solution is available at an attractive and affordable price, only $2.99 . 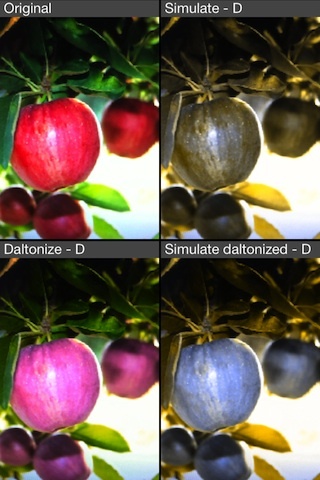 iDaltonizer is a multi-use iPhone app geared to alleviating the day-to-day problems faced by those affected by colorblindness. A rich complement of features means that persons affected by any of the three types of colorblindness stand to gain from the app, which can be adjusted with precision on three modalities and two scales, and offers six different viewing experiences. All these combinations and adjustments can be used to view your surroundings in real-time or to take photos with. If you have a family member or friend who is affected by any form of colorblindness, this amazing app will allow you to see things exactly how he/she sees them by virtue of its unique 'Simulated-Corrected' Mode – please see the photographs of the poppy garden in Figure 1. 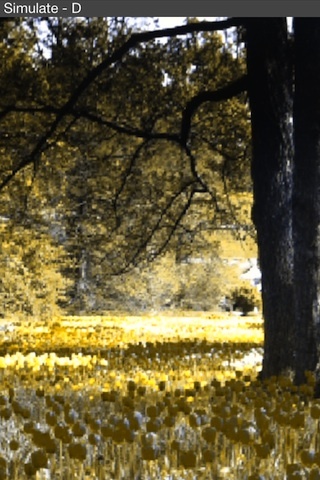 The vermilion flowers and green grass (Original Image) are an indistinct mass in shades of ochre when seen by the colorblind person (Simulate-D Image). But when corrected through the iDaltonizer, the flowers undergo a color shift (Daltonize-D Image). As a result, to the colorblind person the apple now stand out in a grey tone while the grass are still seen as yellow-ochre (Simulated Daltonize-D Image). Though neither iDaltonizer nor anything else can provide color vision to colorblind persons, such individuals can at least see objects of different colors clearly and distinctly whereas without iDaltonizer they are unable to differentiate the petals of a red rose from its green leaves. iDaltonizer takes great advantage of the iPhone's scratch-free display which shows millions of colors and renders the sharpest of pictures. The iPhone is, of course, portable as well. This combination of factors makes the iPhone the best device for any app like iDaltonizer. And iDaltonizer is the best app of its kind on the iPhone – read on, and you'll be a believer! A choice of the type of colorblindness for which you are seeking correction: Protanopia, Deuteranopia, or Tritanopia. Setting of the anomaly level (individual severity) from zero to 100 percent. Setting of the correction grade (degree of correction) from -100 percent to 100 percent. Four modalities: The modes provide a choice as to how you want to view your surroundings, be it in real-time or to take a photo: 'Normal Mode', 'Simulated Mode', 'Corrected Mode', or 'Simulated-Corrected Mode'. Or, combine them: view (or take a photo) in Normal and Corrected Modes side-by-side (an aid for for colorblind persons), view in Normal and Simulated Modes side-by-side (an educational tool for persons with normal vision), or view what's in front of you in all four modes at the same time (four small images in each quadrant of the display). An optional subtitle identifying the mode is also displayable. Flash: Photographs in all modes can be taken with or without flash, as appropriate, depending on the availability of the Flash in the hardware. Zoom/magnify: Make sure to take advantage of the built in magnify/zoom function to enlarge small type. Flashlight / torch: At night or in dark places, turn on the handy-dandy flashlight / torch for a bright beam. Whew! The manifold features and settings of this remarkable app are settable in so many combinations that it is difficult to list and explain them all. The best way to understand the remarkable versatility and flexibility of this app is to give it a spin, but please read on if you want more detail. iDaltonizer's primary usage is best illustrated by example. Look at the normal image of red apples and green leaves, 'Original' in Figure 2. 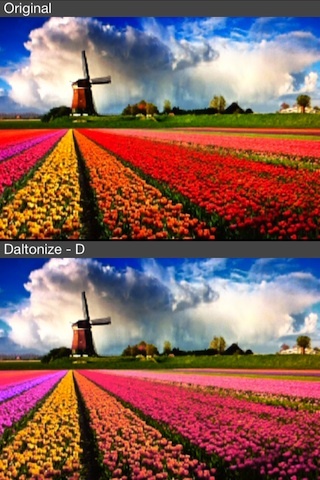 If you are colorblind with deuteranopia, then look at the corrected image 'Daltonize - D'. A stark difference will immediately be visible as the apples and leaves are sharply differentiated in this corrected photo. What is a mass of coppery ochre in the first image is a sharply demarcated image in copper and grey in the corrected image. If you have normal vision, look at the simulated image 'Simulate-D' – the red apples and green leaves are both seen in coppery tints and hues – this is what the colorblind person sees. Indeed, if you compare the shade of the largest apple and the large leaf to its left which is resting on the apple, you will see that apple and leaf are almost the same shade. Now inspect the 'Daltonize-D' image. Here, the hue and tint of the leaves has been left untouched while the apples have undergone a color-shift. As a result, the colorblind person sees the leaves in a coppery shade while the apples are viewed in a highly contrasting crisp grey tone, as shown in the 'Simulate daltonize-D' image. iDaltonizer's primary usage is to render colors, be it in real-time or as photos, so that persons with any degree and severity of protanopia, deuteranopia, or tritanopia do not see scenes and objects in certain shades and tints as an indiscernible, camouflaged jumble, but in clear, distinct, and contrasting shades and tints. The aim is that colorblind persons use an iDaltonizer-equipped iPhone in their daily lives to view or photograph their surroundings whenever they feel the need or desire to do so as this affords them an excellent color-corrected rendering. This is best done after adjusting the various settings of this highly adjustable app (please see Instructions paragraph) to the most precise setting that is optimized for a particular colorblind person's vision. colorblind persons can use iDaltonizer to view any of the various charts used to detect colorblindness. What was previously an ochre or grey mass to the colorblind individual will now be visible in the form of finely demarcated numbers, letters, and objects. The intention is to allow colorblind persons to say, "Ah!" and satisfy their curiosity as to what is really on those hitherto indistinct and mystifying charts. colorblind persons can also share their 'world view' with normal-vision persons. Set the app to 'Simulated Mode' and tell your friends, "Until I got the iDaltonizer, this is how I was seeing the world!" If you have normal vision, use the 'Simulated Mode' to view the world as colorblind persons see it. Or use the 'Simulated-Corrected Mode' to understand how colorblind persons would see a corrected image using iDaltonizer. The images rendered in each of these modes can be seen along the entire range of anomaly by shifting the anomaly level setting through its continuum, and also throughout the continuum of color-correction by moving this setting up and down. Designers for signs and signals can make great use of 'Simulated Mode' in conjunction with the 'Type' setting to determine exactly how different colorblind persons would see a sign or signal – i.e. to find out whether the color combinations would be distinguishable to colorblind persons. The 'Simulated-Corrected Mode' allows persons with normal vision to see the corrected image that is viewed by colorblind persons. In sum, anyone who has an interest in sight, vision, or optics will have hours of fascination with this app, especially considering its myriad settings and combinations. You can set the 'Type' to any of three settings, move and shift through each of two continua, and view your surroundings in any of four modes for a fantastic combination of viewing and color renderings! Normal vision or colorblind, you'll appreciate the thoughtful touch-control zoom/magnify feature when you come upon some small print. And if you drop your key in some dark nook or cranny, just turn on iDaltonizer's useful torch/flashlight! The following detailed instructions are for vision-corrective usage of the app by colorblind persons. 1. 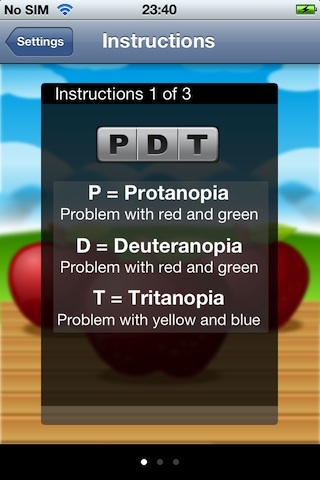 Choose the major setting of Type of colorblindness: protanopia, deuteranopia, or tritanopia. Protanopia is colorblindness resulting from insensitivity to red light, deuteranopia, from insensitivity to green light, and tritanopia, from insensitivity to blue light. It is possible to make this setting using trial and error to find out what kind of colorblindness you have; however, with the other two variables (anomaly and correction grade) also coming into play, it is strongly recommended that your exact type of colorblindness be clinically pre-determined. 2. Set the anomaly level, adjustable from zero to 100 percent. This setting compensates for the severity or anomalousness of a specific individual's colorblindness. 3. Set the correction grade, adjustable from -100 to 100 percent. This setting provides the requisite level of color correction for a specific individual's colorblindness. This particular combination of settings will provide the colorblind individual for whom it is made with an optimal viewing experience of the world around him/her. Once the exercise is complete, store these settings in the app's memory or make a note of them. You or your friends may change the settings to experiment and if you do, you will want easily to revert to your personal settings. Now go ahead and view troublesome objects or scenes in real-time through your iPhone and take photographs of them in 'Corrected Mode' – it's the clearest, most distinct and contrasty way you've ever seen the world. Enjoy! One may think this counterintuitive but the fact is that other apps that have to do with colorblindness offer only simulated images, i.e. displaying to those with normal vision how a colorblind person sees the world around him. But this facility does not aid those who are colorblind. iDaltonizer – of course – allows real-time viewing and photography in 'Simulated Mode'. But, far more importantly, it provides viewing and photography in 'Corrected Mode' so that colorblind persons themselves can see and understand their surroundings in the best possible way. On top of everything, it offers a unique 'Simulated-Corrected Mode' so that persons with normal vision can understand just how colorblind persons would see that same image in 'Corrected Mode'. Considering that a mere medical electronic magnifier costs nearly as much as an iPhone and can perform only one of the numerous functions of iDaltonizer, this app offers unmatched value for money. iDaltonizer does not purport to be a medical instrument and it does not purport to cure colorblindness or any other vision defect. performing any task that exposes yourself or others to hazard. iDaltonizer developers accept no responsibility or liability for any damage, disability, or harm arising out of misuse or irresponsible use of the app. It is strongly recommended that you use iDaltonizer responsibly and in consultation with your vision-care specialist or physician. iDaltonizer is an application built with utmost seriousness and is not a game but, in the lives of many colorblind persons, it is a 'game changer'. Change the game – for a small price get 'i'-Daltonizer and 'daltonize' your 'eye' today! Image processing of album's pictures. Swipe left/right to change views layout. Any questions? Or are you simply happy with this application? Please, let us know! http://www.idaltonizer.com, Copyright © 2012 dariolocci.it. All Rights Reserved.